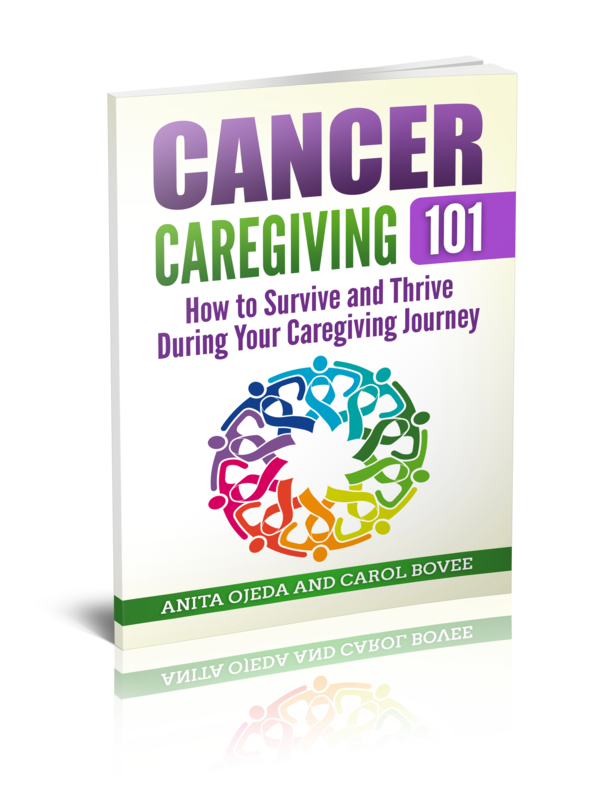 If there’s one thing I’ve learned from cancer, it’s that guilt won’t cure it. I’ve also realized that there’s nothing like a pregnancy or a bad illness to bring out the loads of advice from well-meaning friends, family and strangers. The important thing is to understand where the guilt comes from and know what to do with it. Guilt comes in two flavors—justified (as in you do something wrong or hurt someone and your conscience alerts you to the fact that you’ve done wrong) and unjustified. The unjustified guilt unreasonably pokes and prods you and prevents you from finding peace. Unreasonable guilt can pop up at any time. For example, I feel badly if I refuse a fitness tip from my Wii fitness cartoon when I’m in a hurry and want to skip straight to the exercising. Unreasonable, I know. The cartoon doesn’t really care if I follow through with its advice. Of course, when disaster strikes, real people come out of the woodwork to offer their solutions. That’s what happened to me when my husband had cancer. I wanted to please everyone. The trauma of the situation set up an internal dialogue system whereby I would suppress my initial reaction—yet feel guilty if I didn’t take the advice. After all, those who gave the advice had good intentions. Looking back, I see that I let everyone’s shoulds and coulds practically squash the life out of me. Well, I wouldn’t mind visiting Cuba, but Pedro has no desire to hang out there as long as there’s a Castro on the throne. But I felt badly about turning down well-meaning advice and researched an article or two about Cuba’s cancer treatment programs. Um, he might be dead in two months. He has stage IV non-Hodgkin’s Lymphoma—it grows rather quickly! But I couldn’t help promising to check out juicers. Not worry? When I’m separated by thousands of miles from my husband? We need to be close to each other in order to survive this. I don’t care if your hospital made U.S. News and World Reports’ top ten list. That’s just too far away. But I did research that hospital. I’m happy for your aunt’s ex-husband’s sister-in-law’s neighbor. But, no. Of course, I couldn’t help looking at the website, though. THAT person happens to be a friend who traveled thousands of miles just to let us know that he cared. Wait a minute! Whose cancer is this? But I did start wasting Pedro’s valuable energy consulting him about visitors. Really? And here I thought I sat quietly in the corner, only asking the occasional question when I didn’t understand what they were doing. I keeping Pedro’s spirits up and walking with him and helping him eat will help with his recovery. I must be living a double life. But of course I turned my internal behavior monitor up a notch—eager to prove that I could act as the model family-member-in-the-room. I’m sure you’ve suffered like this, too, with a litany of ‘you should’ and ‘you ought’ aimed your way. They pile up and threaten to drown you, because you probably already have a fair amount of self-imposed guilt weighing you down. But I discovered something important. 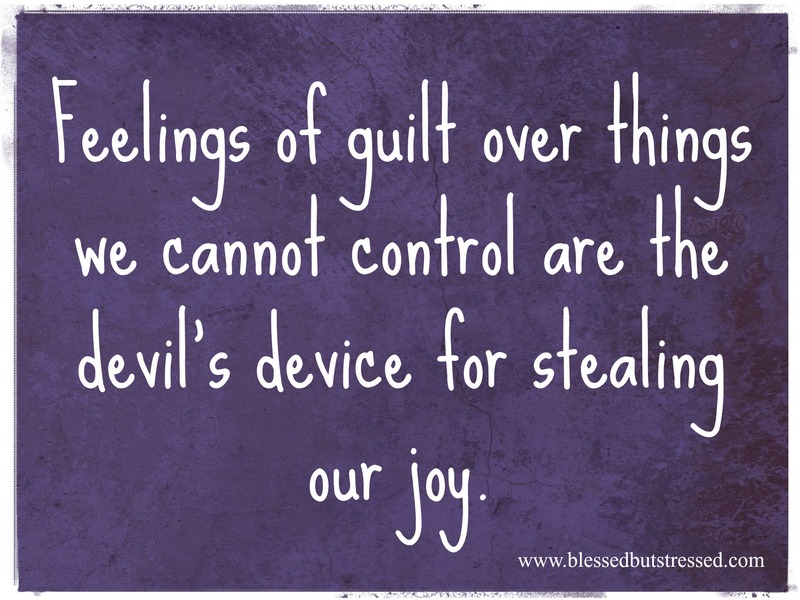 Just like there are two flavors of guilt, there are two places that guilt comes from. Justified guilt comes from the whisper of the Holy Spirit, and the intent is always to bring us back into a right relationship with God. Both types of guilt require work, though—but we don’t have to work alone in either situation. For the justifiable guilt, God wants us to come before him in faith with a repentant, sincere heart. Not only will he forgive us (1 John 1:9), but he’ll cleanse our guilty conscience as well (Heb. 10:22). The second kind of guilt—that feeling of regret, remorse or inadequacy—requires a different kind of work. First, we need to recognize it for what it is—an attack by the deceiver. Second, we need to put the devil in his place in the name of Jesus. (Mark 8:33). Third, we need to train our minds to remember that the ‘you shoulds’ and the ‘you ought tos’ are merely suggestions. In retrospect, I can see that my guilt and consequent actions were misplaced. Those should statements* made me feel inadequate and guilty because I worried that if I didn’t do what someone suggested, I might mess things up and Pedro would never get better. See how tricky satan is? At no point in Pedro’s cancer journey was his prognosis or healing in my hands. It never depended on me. I am not God. When someone makes a suggestion prefaced by ‘you should’ or ‘you ought to’ or ‘you could’, simply ask yourself, “Do I want to do this?” If the answer is, “Yes, it sounds wonderful!” smile and ask the person for more information. If the answer is, “No! Are you kidding me?” smile and politely reply, “Thank you for the suggestion.” By calling it a suggestion, you subtly remind the person that what they are offering is simply a suggestion and you have no obligation to follow through or actually do what they suggest. God doesn’t want our view of him fouled by false humility and misplaced guilt. When we’re justifiably guilty, we need to make it right with him. When we’re unjustifiably guilty, we need to ask for God’s help to banish the insinuations of the devil and train ourselves to tackle the shoulds and oughts in an appropriate manner. *Dr. David D. Burns, in his excellent book Feeling Good: The New Mood Therapy points out that should statements are cognitive distortions. He offers excellent suggestions for dealing with the debilitating habit of should statements.